Vinegarones are any of the species of scorpions belonging to the taxonomic order Uropygid, and are also known as whip scorpions. They are not insects, but an arachnid. Like all Arthropods, vinagrones are invertebrates with tough exoskeletons. It gets it's name (Vinegarone) from the acetic acid, which has a vinegar like smell. They range in size from 25 to 70mm in length, but the largest species, Magistoproctus, can reach 85mm. The name uropygid means tail rump, referring to the whip-like telson on the end of the pygidium, a small plate made up of the last three segments of the abdominal exoskeleton. Uropygid use only six legs for walking, they have two other sets of legs but they are mainly used for antennae-like sensory organs. 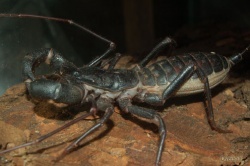 Most species also have a scorpion like pincer. They have one pair of eyes located at the front of the cephalothorax (The anterior section of arachnids and many crustaceans, consisting of the fused head and thorax). The vinegarone has no poison glands, but it has formic acid and acetic acid that it can spray when it is bothered. The reproduction starts when the males secrete a sperm sac, which is transferred to the female. There can be up to 35 eggs laid in a burrow. The mothers stay with the eggs and do not eat the whole time. After the young hatch from their eggs, they climb onto their mother's back and attach themselves there with special suckers. After the first time they shed their skin they look like miniature whip scorpions, and shortly after they leave the burrow. The mother dies shortly after the babies leave the burrow. Uropygids are found in tropical and subtropical areas worldwide, usually in underground burrows which they dig with their pedipalps (One of the second pair of appendages near the mouth). They may also burrow under logs, rotting wood, rocks, and other natural debris. They enjoy being in a humid and dark environment to avoid the light, and stay cool. This page was last modified on 30 November 2012, at 22:06.